1. **Take breaks, reverse posture and move at least every 20 minutes. Tissue integrity begins to weaken after about 15 to 20 minutes of load/stress from prolonged position. Although this happens on a microscopic scale, the effect is cumulative over time and predisposes one to injury. 2. *Avoid slumping; the use of a lumbar support pillow or a rolled towel adds significant low back support. Prolonged slumping is thought to produce disc protrusion, ligament and muscle fatigue. 3. Prolonged positioning reduces circulation, thus, movement breaks re-circulate blood flow to the tissues. 4. Forearm to upper arm angle is best maintained at 75 — 90 degrees. 5. A footrest is required when the feet cannot be firmly placed on the floor. 6. Thigh and trunk (body) angle should be at 90 degrees. 7. Knee angle should be at 90 degrees. 8. Make use of your swivel chair; avoid twisting your back when turning. 9. Practice relaxation & movement techniques during a break. 10. 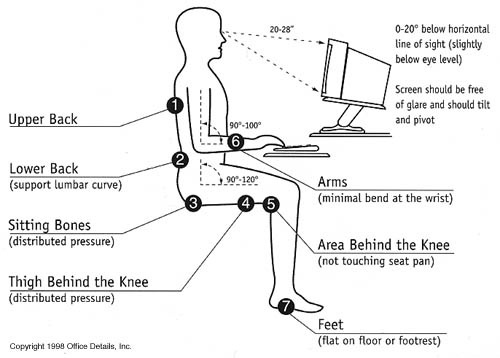 Computer screens are best situated 14 to 30 inches in distance from the face. 11. The center of the computer monitor should be most comfortable at chin level. 12. Materials on your desk, which are used at high frequency intervals, should be placed for easy access. 13. Bracing a telephone between head and shoulder is a common cause of neck problems and should be avoided. 14. Direct light from a window or lamp can cause visual interference/screen glare producing eyestrain. Glare screens can reduce this problem. 15. Too much heat from the sun through a window or too much cold from the AC can cause discomfort and muscular reactions. 16. Excessive room noise can be stressful. Modular room dividers can be very helpful at reducing this problem. 17. Frequently changing your field vision will reduce eyestrain. 18. Bifocal glasses requiring backward head tilting can precipitate neck pain. 19. Leaning forward with an unsupported back will produce back pain. 20. Constant one-sided twisting or leaning will produce muscular and spinal imbalance leading to pain and stiffness. 21. Source documents should be at the same level as the screen if possible. 22. A neutral wrist angle is best to avoid hand & wrist problems. 23. Avoid resting your wrist on sharp edges. 24. Your keyboard should be adjusted to compensate for wrist comfort. 25. Your seat pan angle should be adjusted or changed to reduce pressure on your thighs. 26. Sitting on a wallet will produce imbalance, poor circulation and sciatic nerve compression. 27. Headaches are frequently produced from neck strain and/or eyestrain. 28. Practice mini-breaks with desk exercises. 29. Your desk chair should have adjusting capabilities for both vertical and horizontal changes for better back support.